Does SELL MORE help Real Estate agents? Faye just handed in her homework for this month with the SELL MORE Program. How’d you’d like to give your clients homework that includes them sharing how they feel about you? It’s been pretty fun. But there is a purpose to it that helps their business dramatically. By the way if you’ve ever wondered if SELL MORE can help Real Estate agents you’ll be interested in Faye’s video. 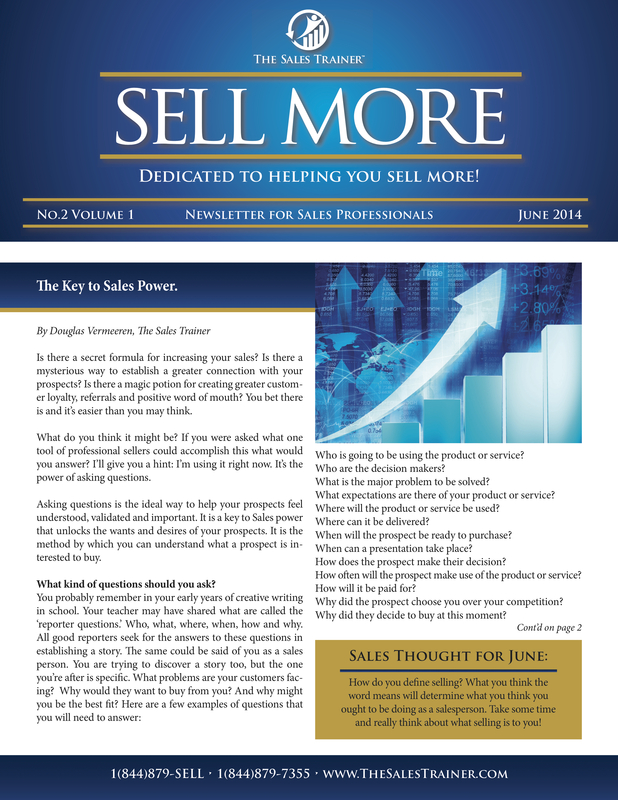 SELL MORE June Edition is now available. Closing is not where you get the deal. Here are a few simple thoughts on better closing. This is not an article. Just some random thoughts I was having as I thought about the subject this morning over breakfast. Yes, I am constantly thinking about sales. I encourage you to do the same. Where we invest our mental energy is where we begin to unlock our brilliance. What we learn affects what we earn. So take some time and think about these things. By the way one of my hobbies is certainly something that a lot of people would think is weird. Some people collect baseball cards, bottle caps, comic books etc. I actually collect sales closes. That’s right. I said Sales closes. Every time I see one, hear one, read about one I write it down. I currently have just over 2000 sales closes. Now I want to point out that I didn’t say that they are all brilliant. In fact, I have some good, bad and ugly. Some are absolutely hilarious. Some are downright embarrassing and terrible. But many are brilliant. The thing I also like about having so many closes are that some are better suited to my selling style and some are not. With so many to choose from I certainly have several that work for me. Often I have shared these with my students and many that would never work for me have worked incredibly well for them. I encourage you to start keeping your own collection. You don’t have to collect tot he extent that I have, but at least try to find a handful of closes that you really like an work well for you. Try and memorize them and have them ready to use. Anyways, here are a few morning thoughts on closing. A great close at the end is not where the deal is finalized. A prospect has often made their decision long before you ask for the deal. A close is where that decision is declared. The decision has been made in incremental steps along the way as you have successfully demonstrated value, solved their problem and connected with their specific wants and needs. Closing doesn’t get you the deal it confirms the deal. The conversion of your customer is not an event, but a process.So you remember earlier when I talked about collecting closes? Make sure that you are collecting closes that can be used through out the sales process, not just at the end. The final close is where it becomes clear whether you’ve done your job sharing the value or not. It is the time when you shift from the emotion of the sale to the logistics of delivery and terms. This is also what makes it difficult for most people to close. The #1 challenge that I have seen entrepreneurs and sales people experience is asking for the deal or asking for the money. The reason why is generally the haven’t properly prepared the prospect or they don’t know how to make the transition from the emotional, value driven part of the sale to the logistical transaction part of the sale. I call this the transition and unless you understand how to do it it can be stressful and cost you the sale. These things should be done and confirmed through out the sales process. 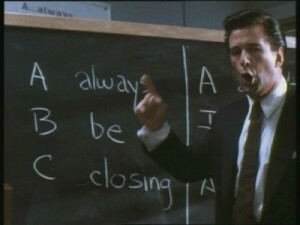 That’s why the popular phrase Always Be Closing (every sales needs ABC) is one of the biggest truths in sales. If you close early, often and even on the little things you will see a higher percentage of your prospects become customers. Very few prospects will ever be turned into a customer from one big close. But as they commit in degrees or identify the value for themselves in little steps they are pulled towards the sale. Well, I guess that’s enough for today. I’m sure I’ll touch on closes again in the future. It is such an important part of the sales process and there is so much to say. I doubt if a thousand articles could finish the subject. Hope today was useful and I look forward to next time. Does SELL MORE get a passing grade? Have you got a sales team to train? You might want to hear about a secret tool Brian found.